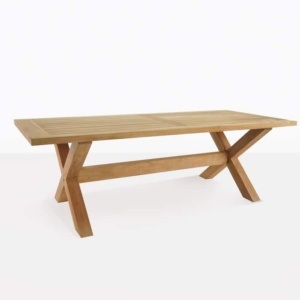 The Somerset Trestle Table is a strong and stable Dining Table with a monolithic feel. 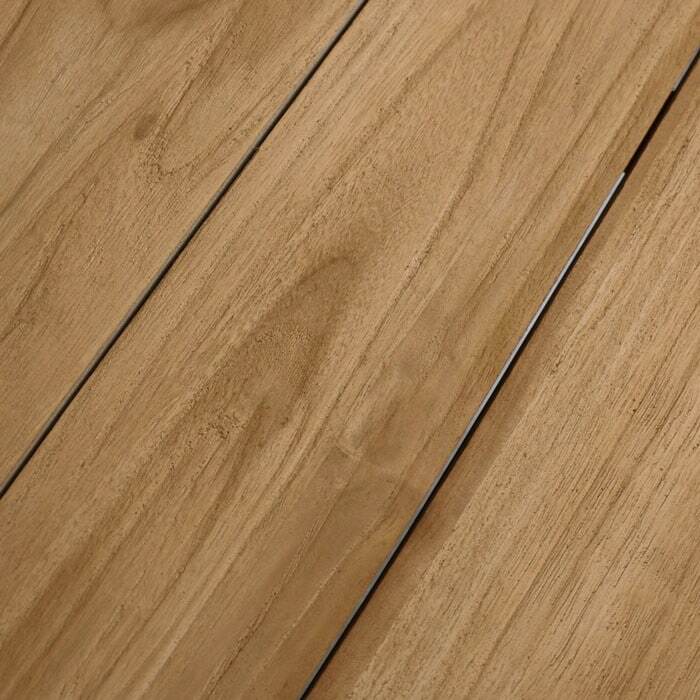 The highest grade teak is cut to substantial timbers with a simple but classic design that works well with a large amount of outdoor spaces and a host of different dining chairs from modern to contemporary to classic. 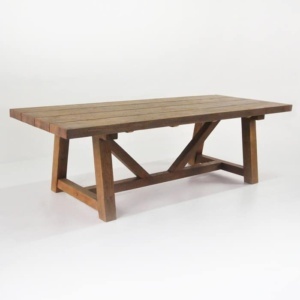 We have a similar trestle table in Reclaimed Teak; a perennial best seller. This new Grade-A Teak Trestle table is beginning to take off too. Our customers have absolutely fallen in love with it; from the plank style table top and chunky legs; the fashionable trestle style and all the attributes of premium Grade-A Teak. This classic table is unpretentious, but also can make a style statement depending on how you stage it and the dining chairs you decide to add to it to complete your outdoor dining set. In three sizes, this outdoor dining table is perfect for families and entertainers of all types, with room for, 6, 8 or even more than 10. Benches with the same stable trestle design and Grade-A Teak can create a perfect mix of utility and good looks. Imagine a cool calm night, with good company, excellent food, great wine and a starry sky. This is the place to be, with food and drinks, good conversation and tranquility. The perfect place for a relaxing dinner party is outside during the early summer or whenever you feel the weather is right. Pair this table with traditional wicker dining chairs; teak dining chairs with a more modern flair, like the Fiesta Dining Chairs or if you’re feeling a bit more contemporary, try some of these stunning stainless steel dining chairs.. 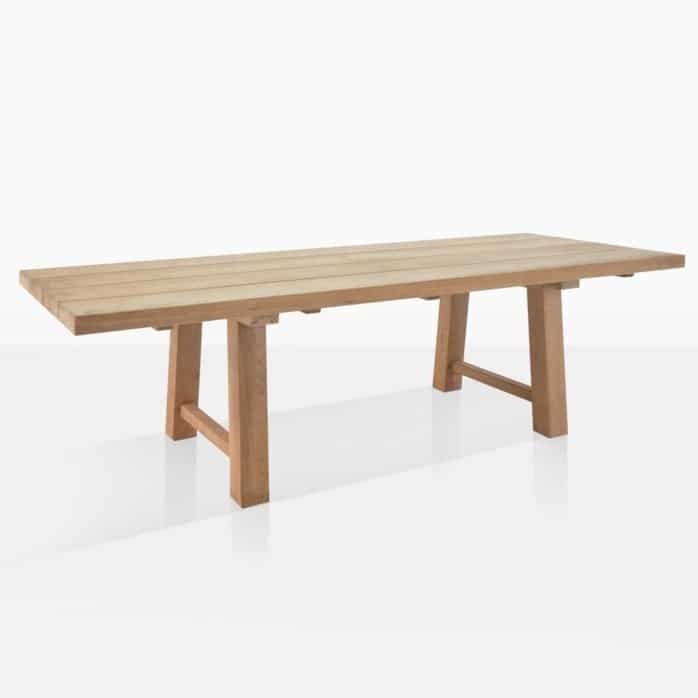 Regardless of the dining chairs you choose, one thing is certain: you cannot find a better value on a solid Grade-A Teak Dining Table, built to last a lifetime, than the Somerset Trestle Table.